PT XL Axiata Tbk is one of the major cellular providers in Indonesia. PT XL Axiata Tbk. 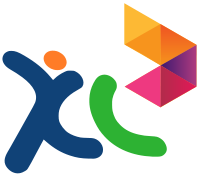 is part of Axiata Group with Robi (Bangladesh), HELLO (Cambodia), Idea (India), MTCE (Iran), Celcom (Malaysia), Multinet (Pakistan), M1 (Singapore), Samart (Thailand) and Dialog (Sri Lanka), to advancing Asia. XL is now leading the industry as a cellular telecommunications provider with extensive coverage throughout Indonesia. It provides services for retail customers and offers business solutions for corporate customers, including voice, data and other value-added mobile telecommunications services. PT XL Axiata Tbk is one of the major cellular providers in Indonesia. We are striving for the best in our field by expanding our operation throughout Indonesia while focusing in fulfilling customers’ hopes and needs. XL upholds the vision that ensures employees can continuously expand their selves. Those whom possess the knowledge, skill and values focusing towards customer and quality oriented individual whom also a team player are the best to expand the company and improve their career. If you are an individual with the above characteristic, please join us and grow with us to together nurture and increase the value of the company.